Egg noodles in a sweet chilli dressing with carrot. 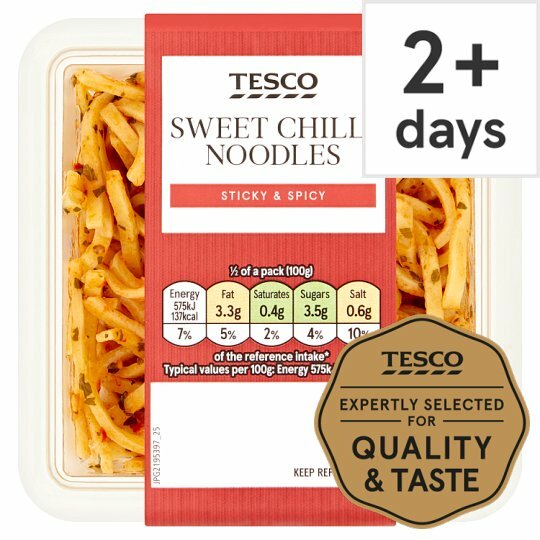 Tesco Sweet Chilli Noodle Salad. Egg noodles and crunchy carrots tossed in a chilli dressing. INGREDIENTS: Cooked Egg Noodles (66%) [Water, Wheat Flour [Wheat Flour, Calcium Carbonate, Iron, Niacin, Thiamin], Pasteurised Egg, Firming Agents (Potassium Carbonate, Sodium Carbonate), Salt, Turmeric, Paprika], Sweet Chilli Dressing (26%) [Water, Sweet Chilli Sauce [Sugar, Water, Red Wine Vinegar, Red Chilli, Cornflour, Garlic Purée, Salt], White Wine Vinegar, Soy Sauce [Water, Salt, Soya Bean, Wheat Flour], Coriander, Concentrated Lime Juice, Ginger Purée, Rapeseed Oil, Garlic Purée, Cornflour, Tomato Purée, Red Chilli, Pectin Blend [Sugar, Stabiliser (Pectin)], Colour (Paprika Extract), Carrot, Rapeseed Oil.